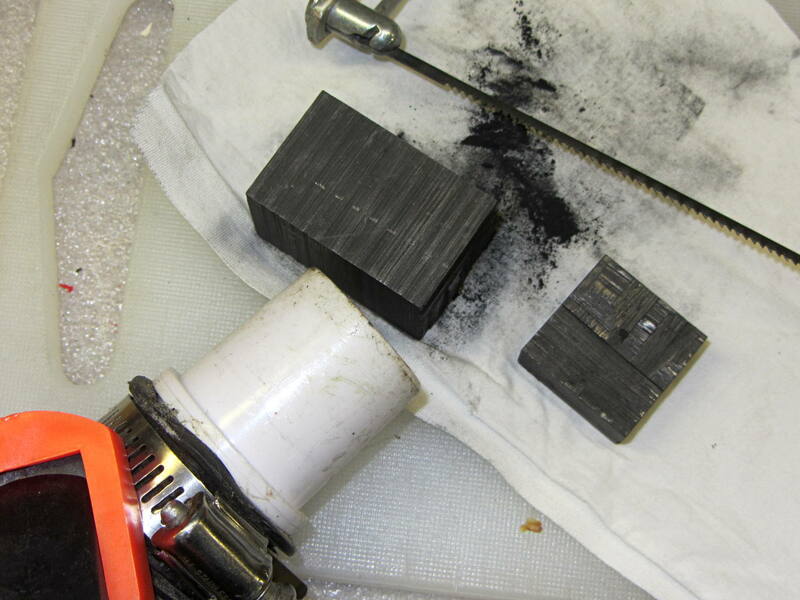 This time, it had one cracked wafer and several thin ones, reducing the length of the stacks so much that the pedal exerted very little force (thus, not starting the motor) before the shorting contacts caused a runaway. A rough measurement showed I’d have to double their thickness to about 7 mm each, but it seemed like replacing high-resistance carbon with low-resistance brass wasn’t a Good Idea, at least when taken to an extreme. Not knowing what would count as an extreme in this situation, I decided to replace the brass disks with graphite cylinders sized to fill up the empty space. Much to my surprise, the shop vacuum didn’t quite inhale the cloth, I didn’t drop either of the cylinders into its gaping maw or sand away my fingertips, and the cylinders emerged more-or-less good looking. I sanded the faces reasonably smooth and parallel, removed a few high spots left by the Dremel, and the cylinders slid neatly into the holes in the ceramic rheostat. 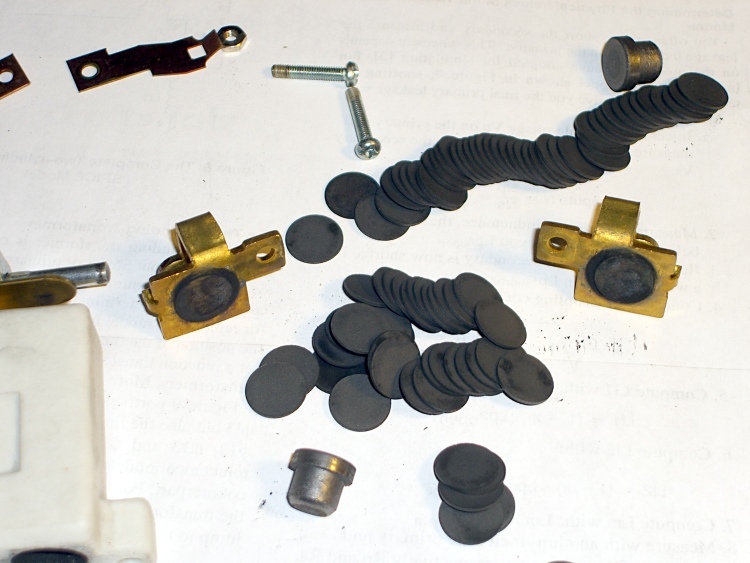 I put the cylinders at the end of the stacks, against the graphite buttons (shown in the top picture), and left the disks to settle themselves against the brass contacts. In retrospect, I should have put the cylinders against the brass, so that the inevitable erosion will chew on the (relatively) easily replaced bulk cylinders. 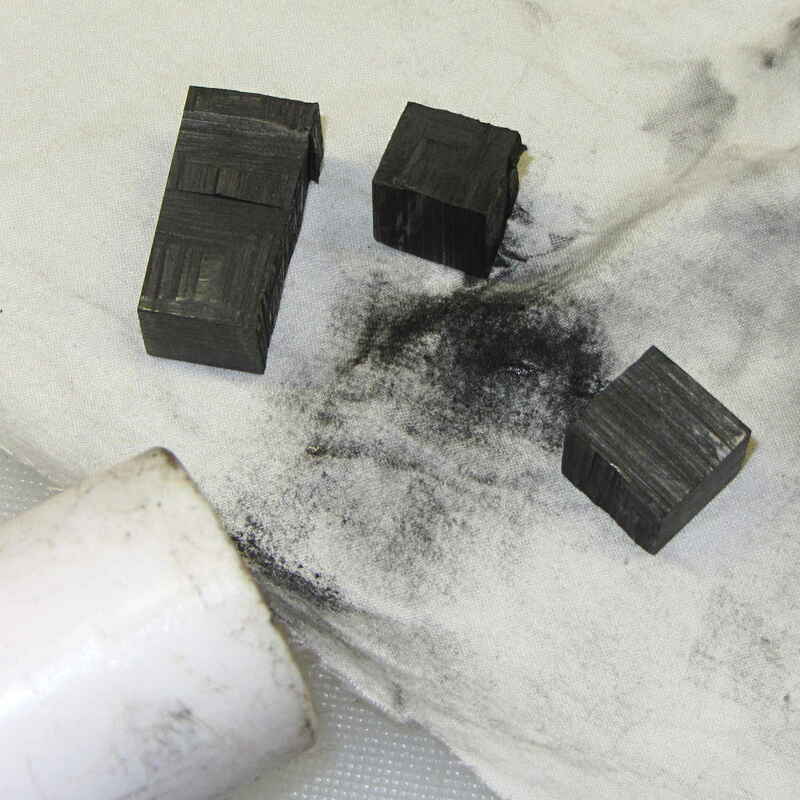 Each graphite cylinder displaced six disks, so now I have some spares for next time. 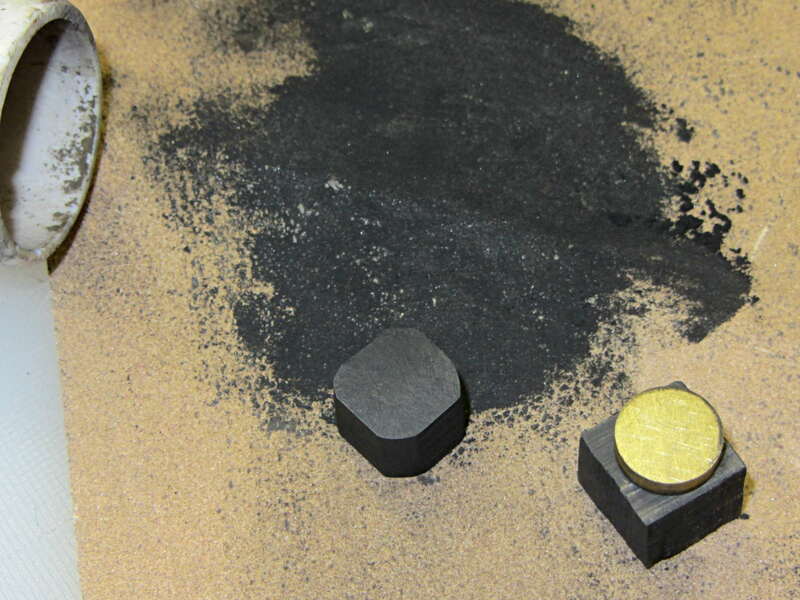 I’m certain that the graphite has lower resistance than the equivalent length of disks, but it’s probably higher than the same length of brass. I was not going to slice those cylinders into disks. After vigorous and repeated handwashing with gritty cleaner after leaving the Basement Laboratory Workshop, the pedal assembly went back together smoothly and, once again, operates the way it should: controllable smooth low speeds, crazy-fast high speeds, and a steady transition between the two. Mary has resumed quilting up a storm. That shop vacuum may never forgive me, but it totally eliminated all the carbon dust from the work area. The filter started out coated with a generous layer of dust and crud, so I’m pretty sure it collected most of the very fine dust, too. I briefly considered using the lathe, but came to my senses. The cheap way to do AC motor speed control involves a triac chopping the sine wave, so as to produce all manner of hash above and beyond the usual motor commutation noise. It occurs to me that the sewing machine has a universal motor that would run just as happily on 120 V DC as it does on AC, so a cheap 120 V DC supply (around 2 A should suffice) from the usual eBay supplier and a high voltage MOSFET on a generous heatsink would work even better. One might even get by with just a full-wave rectifier bridge and pulsating DC. The rheostat doesn’t dissipate more than a few watts, I think, so thermal management should not pose a serious problem. The motor rating says it’s good for 1 A, which means the power should be less than a few tens of watts. Some resistance and current measurements are in order. You can actually buy replacement pedals, but what’s the fun in that? 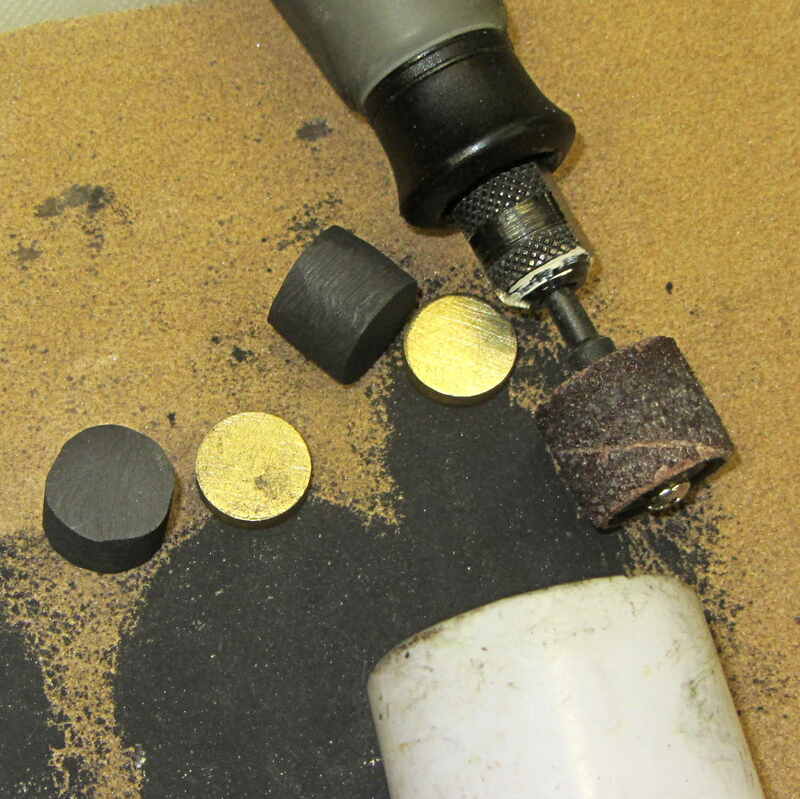 This entry was posted on 2014-02-19, 07:52 and is filed under Electronics Workbench, Machine Shop. You can follow any responses to this entry through RSS 2.0. Both comments and pings are currently closed. I would have put some window screen on the end of the vacuum hose, to keep it from gobbling up anything bigger than grit. But happily, you didn’t need to. That Kenmore pedal looks fearsome. Reminds me of an old line: “Don’t worry, we’ll engineer all the simplicity out of that product!” I used a coil rheostat and a used sewing machine motor for a weaving bobbin winder. Seems to work just fine, and the pedal was cheap. It’s about as brute-force as you can get, but correspondingly durable. Despite my kvetching about the pedal, the sewing machine has been running well since the late 70s, which makes up for a lot. I think the disks evaporate into gas as they’re used, because they definitely get thinner without producing debris. I just bought an identical sewing machine as a crash test dummy and plan to see which pedal works best. Perhaps combining disks from two pedals will produce one original-spec unit! I’ve had good luck with coil based rheostats so far. Lost a pedal (mid-50s vintage) to bad insulation, and a gas tank sender that opened up due to vibration on 50 miles of washboard gravel road. The latter one was fine from full to 50% when it hit the open. At least it was easy to swap out. Julie’s main sewing machine uses an air bladder and pressure sensor to work. It hasn’t failed in 30 years [yet], but I know the location of the local machine-fixer. I’ve done minor repairs on the Elna, but it’s pretty much German-inspired engineering, for good and bad.